Before joining Carroll and O’Dea in 2016, Ben Robertson practiced in various private practice firms and was employed as General Counsel and Company Secretary at a leading project home building company. Providing advice on Creditor’s Statutory Demands. 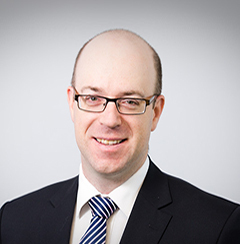 In addition Ben has acted for strata schemes in levy recovery matters, appearing in contested Local Court hearings and bankruptcy applications in the Federal Circuit Court of Australia. “‘I wish my lawyer had provided me with a 30 page advice with full case citations’ – said no one ever. Achieving practical and commercial results for clients involves recognising and communicating relevant key legal issues and developing coherent strategies in order to arm those clients with the tools to make informed commercial decisions or the armoury to litigate where necessary”. Obtained Bachelor of Arts (Psychology major) and Bachelor of Laws at Macquarie University. Admitted to the roll of the Supreme Court of NSW in 2001. Entry on the High Court Register of Practitioners in 2014. Numerous presentations of the Cumberland Division and the Northern Suburbs Division of Master Builders Association. Presentation to City of Sydney Law Society and the Parramatta & District Law Society – “Building and Construction Industry Security of Payments Act – A Review”. Ben has written articles published in Master Builder: Official Magazine of the Master Builders Association of NSW and Inside Strata Magazine.